The What: Key Digital has launched the KD-SX440WP wall plate HDBaseT/HDMI extender kit. The KD-SX440WP is a wall plate input presentation switcher and extender kit ideal for professional video installations in conference rooms, huddle spaces, classrooms, and more. The What Else: KD-SX440WP is HDCP 2.2 compliant and consists of KD-SX440WPTx and KD-SX440Rx. 4K/UHD 24/25/30 (4:4:4) and 4K/UHD 60 (4:2:0) signals are extended up to 230 feet using a single Cat-5e/6 cable. 1080p/60, 1920x1200 signals are extended up to 328 feet. In addition to AV signals, KD-SX440WP extends IR and RS-232 for controlling remotely located equipment. 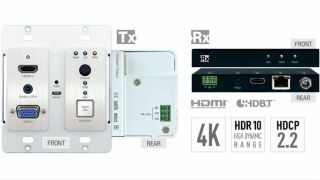 The wall plate unit (Tx) fits in a standard U.S. dual-gang box and is powered by the Rx unit for convenient installation.